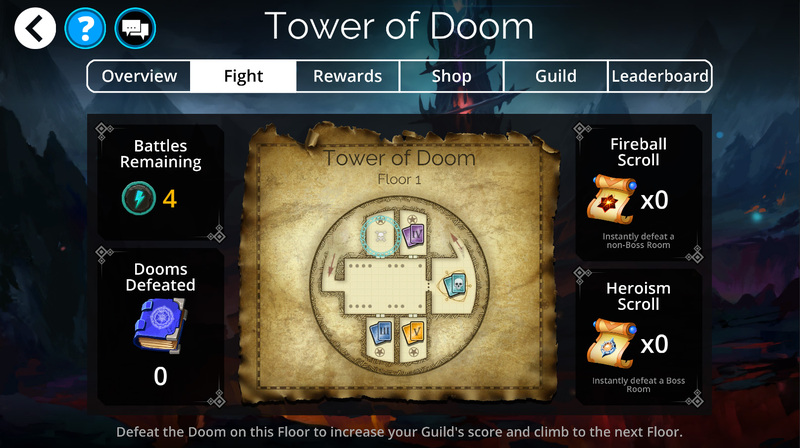 * Each Tower of Doom will be focused on a specific color. Teams allowed into the tower will be restricted to this color, and the Ultimate Doom located on the 25th floor will also be that color. * Each Guild Boon found counts towards earning skill points for everyone in the guild. Once enough Boons (of a given type) are obtained by guildmembers, everyone earns a point. For example, the first player to find a Life Scroll, earns a point of Life for everyone in the guild. Then, when two more Life Scrolls have been found, everyone earns another point of Life. Then 3 more Scrolls, and so on. * A new Weapon rarity, called Doomed, has been added. A Doomed Weapon is available in every Tower of Doom event. * There are 12 stages of rewards for guilds to work towards. The final stages will require a strong commitment from large active guilds. o	Troop Upgrade – These offers give resources to assist in upgrading Legendary and Mythic troops. o	Gem Deals – These offers are extremely high value, and may only be purchased in limited quantities. o	Weapon Packs – These offers give a weapons, and the resources to temper it, to beginner players. * Battlecrasher events work like encountering a Gnome. A certain troop (the Battlecrasher) will start to appear randomly in battles. Players who defeat it, and win the battle, will receive a reward. * Battlecrasher Troops will never spawn in Guild War battles. 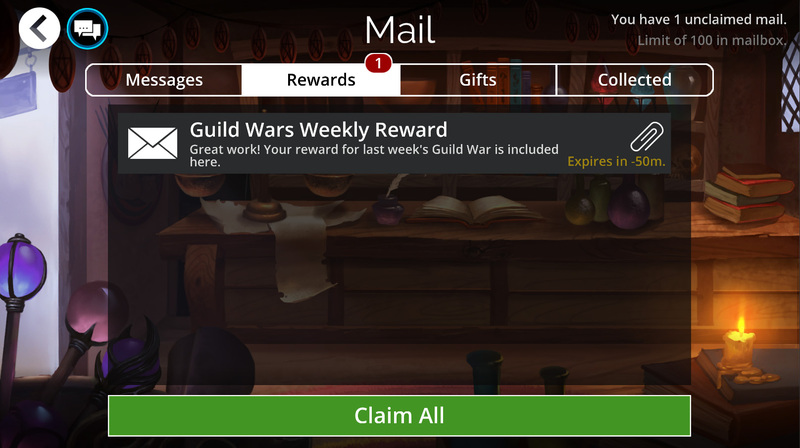 The Mail menu has been upgraded to reflect recent changes in the game. 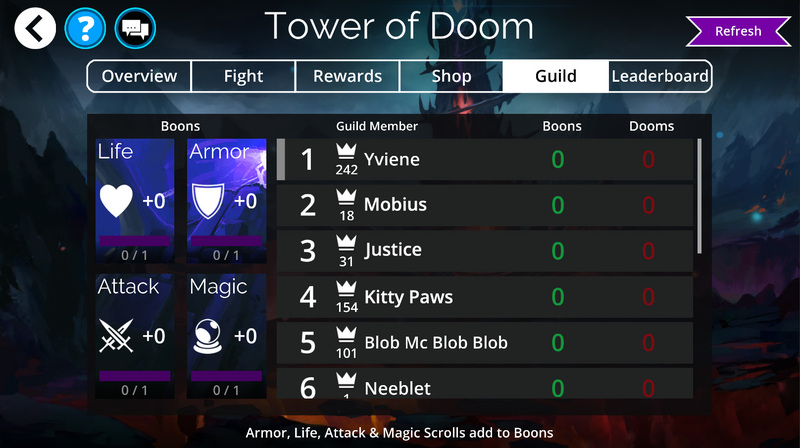 We noticed a lot of players interacting with Faction Events by simply replaying the first difficulty (Level 20) and losing on the boss room, over and over again. Obviously this was not how we intended the event to be played, so we’ve made some changes to scoring. * We have also adjusted the reward/point requirements to reflect the scoring change. * Legendary Trait now deals triple skull damage vs Poisoned and Webbed enemies. (Damage doesn’t stack if enemy has both status effects). We have 2 new achievements are available on PS4, XB1, Steam and Google Play. * Fixed an issue on several traits which were triggering when matching skulls instead of dealing skull damage. This should now match the traits’ description and will no longer trigger if the troop is entangled. (Bonus damage from 4+ Gem matches or Doomskulls, will count as dealing skull damage). * If you previously disabled all Alerts in 4.0, then try to re-enable Alerts after updating to 4.1, it will appear as if Alerts are enabled. However, any Alerts that are not classified as “Inactive Reminder” will not be received. To solve this, please remove the app and install it again. We will have a fix for this in the 4.2 Update. 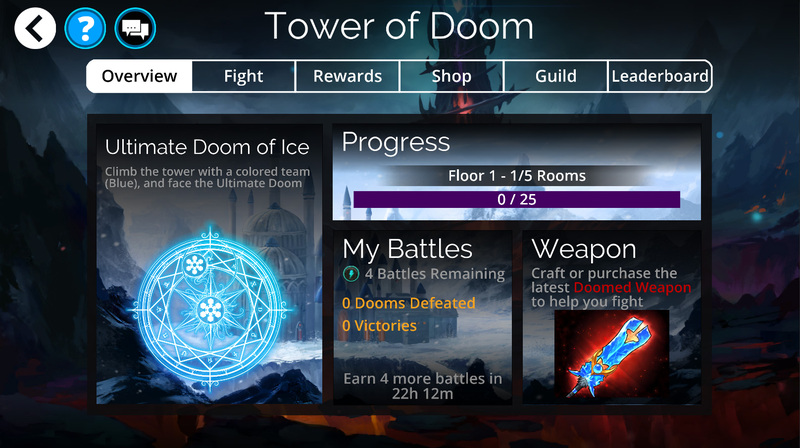 * Visual issue with changes to the Faction event point change, the points display on the room will still display points of the old version, however points will be rewarded correctly. This will be fixed in the 4.2 Update. 22 Comments ON " 4.1 Patch Notes "
When i logged in after new update was installed i was in the daily reward and the bubble pops up and it’s the wizard guide. It was mentioning about traits and ascension. I tried to back out because it picked a card that i didn’t want to forcefully add to and it wouldn’t let me back out. I accidentally wasted trait stone and what ever else was on that card. I was saving for other cards. It keeps poping up and picking cards i don’t want. What do i do next? Wow, great. Players were just doing too well in delves, so of course you nerf the one thing that actually makes the high level delves possible (transformations, specifically Dragon’s Eye). Please do explain how exactly we’re meant to reasonably challenge a level 500 delve now? Would be great to know since apparently our methods were just too effective to be allowed to continue. Especially awesome for those of us who spent loads of resources to craft mythics specifically to make teams with this in mind. That’s a couple of thousand diamonds I’d like back. 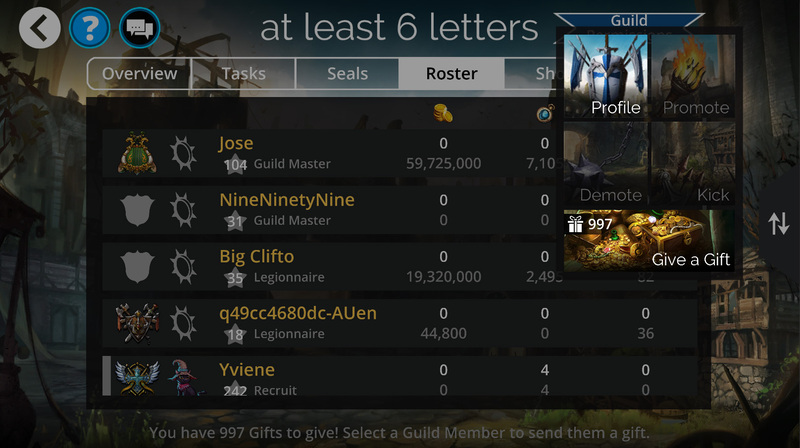 So now things are even more Guild oriented… and you still haven’t given us a way to reach our newbie guild members unless we manage somehow to get them all on an 3rd party comm. Our guild is a mixed level relaxed play guild; upper level (1000+) players encourage new players (level 20+) and help them level up and move on to more competitive guilds – in part because *we can’t communicate with each other*. Half the newbies we let in *never once go to guild chat*. Even a banner that would remind them to do that on the seals page or an email announcement triggered by them choosing to join the guild or receiving divided guild resources at the end of the week would help. *Anything* would help, and it would help these new players integrate and enjoy the game even more. We want people to enjoy the game at their own pace and none of us aspire to the level where 3rd party comms intrude on independent play. It’s a great game – I’ve been playing since beginning and despite some questionable design choices which are probably mobile driven think GOW does an *amazing* job of offering continued challenge to all levels in a fun game. I also know the updates are planned far in advance, so PLEASE think about adding minimal guild communication ability to the list soon. Thanks. Many of us were doing delves on level 20 over and over because of it setting our level in the actual delve after the event. I made that mistake with the Crypt Keepers which I don’t touch outside of an event because it’s at level 100 now and takes too much time.. is the new delve setup going to be independent of your actual delve level or is it still setting your delve level outside of the event? If it is still setting the level in your real delve, I’ll either continue to farm 20 or skip the events entirely.. This is a slap in the face. You didn’t even mention Dragon’s Eye in the patch notes. You’re a dishonest bunch… makes me sick. I’ve spent too much time on this game to be lied to. Shame on you. Lots of time and effort and resources spent just to craft this team. Only for them to change the rules after-the-fact. Offer me a refund, at least of my resources. My time is permanently gone. You have my email. Please reach out if you’d like to make things right. How about a search filter by trait? When searching for troops, I would like a way to see all troops for towers, all troops for bosses, and all troops with bounty traits. 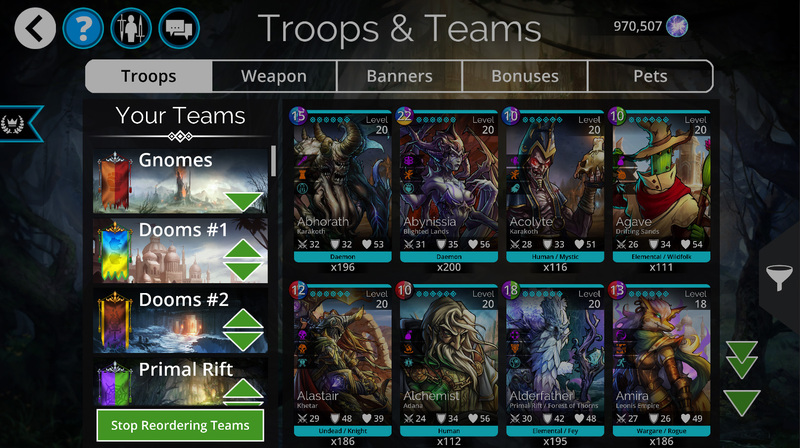 Is there a way to group those troops together to make it easier to find those types? After this update, i can’t see any alert from game. I want to know when pet need rescue. I play this game on ios and android. I re-install this game in all devices but the alert system don’t working. Hi Dawn, that one’s easy. There’s a search box at the bottom of the filter tab. Search for boss or bounty or tower there! I’d like to be able to search for healers myself, but they don’t all use the same wording so they are harder to look for. I would like to be able to search for troops that create a certain color of gem. Since the amount differs between troops, I can’t simply search for “create blue gems.” I have to enter “blue gems,” which lists troops which create, destroy, remove, etc. Got an error message to update the game. No updates available for me to do this. Now completely unable to play game. I would love a class from either Blackhawk or Ursayka. Like Pirate or Bear class. I don’t know how much effort that is on your side but I would really love it. Also would like to see a gift gnome. I know you got gifts now and I love that but I try not to spend too much monz at once. I still support 100%. This has been one of the few games I look forward to playing and I always recomend it. Thanks for all of your effort. I just pulled the game up in the play store and that did it for me. If that doesn’t work for you than sorry for wssting your time.